It’s also called the Padovana of Chili. The breed was included in Italian Catalogues at the end of XIX century (Lion G.F., 1983). 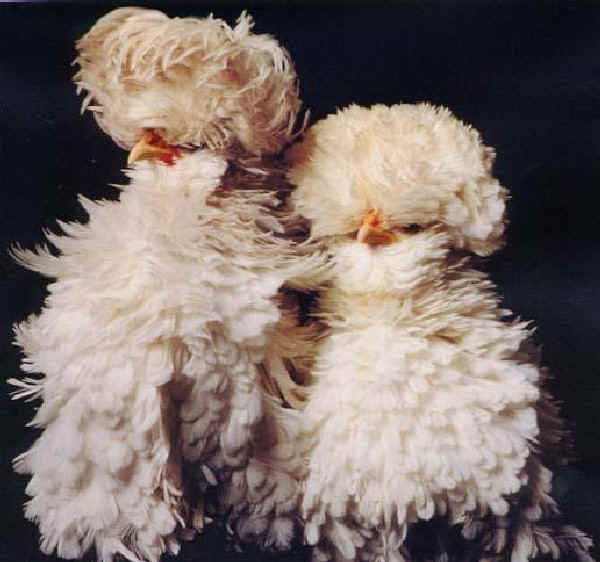 It’s very similar to Tuffled Padovana, but with a frizzle livery, which confers a very ornamental appearance. The breed died out early in Italy, but it survived in foreign countries (most of all in U.S.A.), also in Bantam variety. In U.S.A. the “Padovana riccia” is known as Polish Frizzle and the liveries are the same of Polish (Ghigi A., 1968; Mazzoni I., 1932, 1934). In the two last decades the breed has been re-imported in Italy from U.S.A., but at the moment it hasn’t already been included in the Italian Standard, nor as a variety of Padovana. In any case, it’s a very particular chicken, deserving more regard, at least because of the ornamental look.